Collage Corner Bar does not offer any booking services that we know. You can always contact them to check. 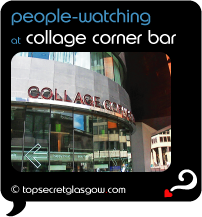 Collage Corner Bar glistens behind shiny glass on a busy city centre corner. Sitting slightly lower than pavement level, guests have amazing views of people hurrying by. Enjoy some gastro pub food, from the high standard expected from the Radisson Hotel, or sip a glass of wine while gazing at the ever-changing views. Decor oozes cool and sparkly, with a classic mix of mirror, shiny wood and leather. This unique bar offers a stylish laid back place to recharge your batteries when out on the town. Great news! Finding this page means you can now join our VIP list for Collage Corner Bar. Grab your very own web page all about Collage Corner Bar. Do you have a special story about Collage Corner Bar? A funny experience? A grand occasion? A funky photo? A personal tip? A top secret?